The seafood choices we make as individuals have a direct impact on ocean health. Seafood Watch® is a program of the Monterey Bay Aquarium that empowers consumers and businesses to make choices for healthy oceans, helping support diverse marine ecosystems for the future. 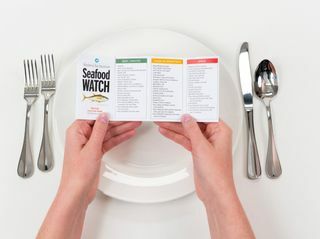 Using science-based, peer review methods, Seafood Watch assesses how fisheries and farmed seafood impact the environment and provides recommendations indicating which items are “Best Choices,” “Good Alternatives,” and which ones to “Avoid.” Seafood Watch raises consumer awareness through its pocket guides, website, smart phone and tablet application, and partnerships with businesses, zoos, aquariums and culinary leaders. The Monterey Bay Aquarium Seafood Watch® program announces the newest 20 members of its Blue Ribbon Task Force, a panel of respected and influential leaders in the culinary community committed to innovative outreach to promote sustainable seafood in 2014. Of the 242 U.S. fishery species assessed, 95% of commercial landings are recommended. Gulf, South Atlantic shrimp a ‘Good Alternative’ except when there are no sea turtle protections. Monterey Bay Aquarium Seafood Watch has rated a number of independent eco-certification standards for wild and farmed seafood as equivalent to at least its own yellow rankings, and will recommend that consumers, chefs and businesses treat seafood assessed under these standards as carrying a Seafood Watch “buy” recommendation. The Monterey Bay Aquarium’s Seafood Watch program works to broaden awareness of the connection between the seafood on our plates and the health of our oceans by helping consumers and businesses choose seafood that supports environmentally responsible fishing and fish farming practices.